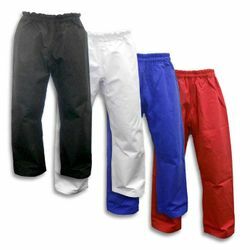 MARTIAL ARTS PANTS sold at the lowest price, Guaranteed. 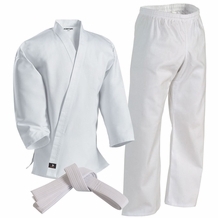 Karate uniforms with Elastic Pants commonly include a drawstring to ensure the pants do not fall during training. An elastic band is embedded on the waist of the uniform to help keep pants secure. Some uniforms only have a drawstring and no elastic band, this will only have a draw string to tie the pants on at your desired position. 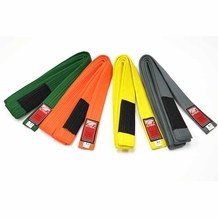 Heavier uniforms commonly exclude the elastic band, and only have a thicker drawstring because at heavier weights, the thicker drawstring is more effective and more secure.